In a repeat of accusations leveled over the last several months, the staff at an Elk Grove high school were recently alleged to have practiced racial discrimination. The claims were made during the public comment section of the Tuesday, May 1 trustee meeting of the Elk Grove Unified School District. The claims center on a student at Elk Grove Unified School District's Cosumnes Oaks High School who school staff alleges stole a pair of earbuds. The student's full name will not be used in the text version of this story. The first of three people to comment on the incident was the student's mother, Leslie Cannon who said her son's teacher accused him of stealing the earbuds in front of the entire class. As a result of the accusation, Cannon said her son was placed under a citizen's arrest. "My son did not steal the earbuds," Cannon said. "The investigation was not complete." Hannon went on to say the campus' school resource officer (SRO) and two other police officers, kept her son in a closed room and forced a confession from him. "They had my son in a room with two other police officers, three police officers, questioning him, telling him, 'if you don't sign this citizen's arrest, you are going to jail,'" she told the board of trustees. "So he signed it." Hannon also said the officers who interrogated her son would not allow him to call her while he was confined. "I just want my voice to be heard," Cannon said. "That something is wrong and something has to change." The student, Julian, told the trustees he was accused during class time by his teacher, Jordan Whitford, who started shouting and accusing him of stealing the classmate's property. Julian also said another classmate was video recording the incident but Whitford told her to delete the video. Julian said the incident initially went no further because he claimed Whitford did not want write an incident report. According to Julian, Whitford informed the parent of the theft victim that it was Julian who allegedly stole the earbuds, and after school, the mother of the victim confronted Julian and his mother in the parking lot. It was two days after the initial classroom incident that Julian said he was pulled from class and interrogated by the police officers. Lorreen Pryor, president of the local branch of the advocacy and watchdog group called Black Youth Leadership Project also spoke on behalf of Julian. Pryor said her group has been tracking student complaints and wants to establish if there was a pattern of discrimination against African American male students. "there seems to be a problem on Cosumnes Oak campus in the way they meed out discipline to Black boys, how they over-discipline Black boys, and how they use the SRO's to deliver punishment instead of the administrators you have in place," Pryor said. 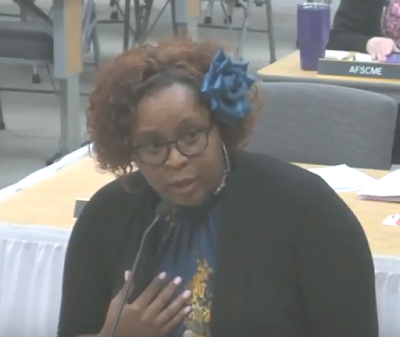 Pryor went on to request information from the school on how many students are sent to SRO's for discipline, that teachers are initiating the action, and how many students are placed under arrests and the racial breakdown of those taken into custody. Pryor added she has several complaints from parents at Cosumnes Oaks that she is currently handling. "There seems to be a problem," she said. "I am asking the board to please investigate that." The entire video of their comments can be viewed below.